Does God really ordain every government ruler, from the decent to the despotic? Does this apply only to the figurehead or to every office at every level? Are Christians ever allowed to defy the state, and if so, how does this not violate Rom. 13:1-7? Let everyone be supportive of the higher authorities, because there is no authority that isn’t under God; those that exist have been arranged by God. That means anyone who plots and schemes against these authorities is violating God’s mandate, and those who do this will be judged. The rulers do not terrorize those who do good but only those who do evil. So if you don’t want to live in fear of them, do good and you will have their approval. The authorities are God’s servants for your good, but if you do evil, fear them! They carry weapons for good reasons; as God’s servants they carry out his anger to avenge God against those who do evil. So it is necessary to be supportive, not only to avoid the anger of God but also as a matter of conscience. That is also the reason you pay them taxes; they are God’s relentless public servants. So give whatever is due: if it’s taxes then pay them; if it’s tribute then give it; if it’s fear then fear; if honor then honor. So I am advocating above all that serious requests, prayers, intercessions, and thanks are done for all people, especially for kings and those in positions of influence so that we can conduct tranquil and respectable lives, with the utmost devotion and dignity. Gently remind them to be good citizens, to be ready to do all kinds of good deeds. First, let’s establish what authorities are in view here. Some believe that the Romans passage refers to church leaders. But unless one spiritualizes the part about carrying weapons, this cannot be the case. Neither are church leaders to be feared as agents of God’s wrath against their fellow believers, since the church is not appointed to God’s wrath (1 Thes. 5:9) and church leaders do not carry authority. Now that we know TPTB does indeed refer to secular government, we can address the question of how Christians are to behave in it. We do have an example of the disciples defying the Israeli government (the Sanhedrin) in Acts 5:29, so there is precedent for disobeying it. However, this governing body was subservient to Rome, a state no one would mistake for an example of moral, ethical governance. And it is secular government to which Paul refers in the passages above. Yet Paul calls them “God’s public servants”. There was a temple tax only levied by Israel, but when combined with “tribute” (secular government tax) it seems clear that Paul had the Roman government in mind. Certainly everyone could agree that a Christian cannot obey any law that would violate our faith, and many were executed by Rome for that reason. So how can we resolve this seeming conflict between what Paul said about secular government, and his own eventual (and wrongful) death at the hands of that government? Is Paul saying that God willed for Rome to be brutal and unjust? Does it mean for us today that if our government uses our taxes to fund abortion or war, we must support it? Did God actually ordain that the current treasonous and criminal world leaders should be obeyed by Christians without protest? God does not cause sin or tempt people to sin (James 1:13). But he does raise up or bring down governments and kingdoms (Dan. 2:21), sometimes to punish others (e.g. Isaiah 10:5-6). And certainly God would and could take down any wicked government as He saw fit. But God does not always do so; in fact, the prophecies of the end times require a whole world filled with evil governments. Yet we still have not answered the question about whether Christians can oppose or even revolt against any government. But perhaps we have; is the key to this dilemma the difference between disrupting the peace and plotting to overthrow the government? 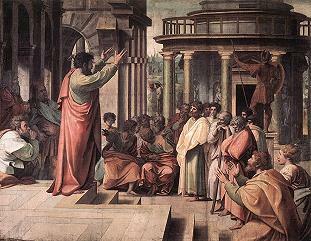 Certainly Peter was not plotting to disband the Sanhedrin, and Paul was not a subversive against Rome. But in both cases, the injustice of the governing body was being confronted. They still had to suffer the consequences of this confrontation, but it was well within their rights as Christians and citizens to do so. Paul spoke of the government as only being fearful to those who do evil. Yet when the government itself is doing evil, Paul does not teach or show by example that we are obligated to comply, and in fact that we are obligated to speak up in opposition. The ramifications of this issue are very important. Some Christians believe that we are to be supportive of the US when it engages in unjust1 wars, because loyalty to the US means never questioning anything it ever does. But this would include supporting abortion for example. How can it be that we should turn a blind eye to the carnage and suffering of aggressive wars while (rightly) protesting the slaughter of unborn children? Conservative Christians see through the double standard when liberals support abortion but oppose capital punishment (killing the innocent instead of the guilty), but seem blind to the same double standard between war and abortion. So can and should Christians oppose the government over any and all unjust laws and actions? Scripture seems to answer in the affirmative. This does not mean we try to overthrow government, either our own or someone else’s. Rather, it means we speak up to defend the oppressed and oppose unjust laws. And when we pray for TPTB, it is so that they will not oppress us, not to wish them success in everything they do. To bless the wicked is to curse the righteous. Then what of the current situation where, in most countries, the governments are so thoroughly corrupt and oppressive that there is no due process, no honest voting, no means of peaceful change? Some leave the oppressive countries, but the list of non-oppressive countries shrinks by the day, and there is nowhere for millions of refugees to go. In the case of Jesus, God told his parents to take him out of Israel for a time, and God gave them the opportunity/ability to do so. In the case of Jesus’ prophecy of the fall of Jerusalem, he told everyone to flee to the mountains (Mat. 24:16). But here again, there was a divine command, an opportunity, and a place to go. Scripturally, it seems that if a wicked government is there by God’s permission, then it is only God who can tear it down. This was the case when Jerusalem fell in 70 a.d. Will the western governments fall? Eventually, yes. But in the meantime, it would seem clear that Christians must not plot to overthrow them, but to keep praying for God to do so, and in the meantime, to pray that we can live in peace. We are to be good citizens to the extent we are able, and without engaging in sin. But we also must stand clearly and strongly against all evil, be willing to speak out and confront, and be willing to accept the consequences. Some believe that any form of government is intrinsically evil. They cite the fact that in scripture most references to governments are condemnations, and that even Israel’s demand for a king was against the will of God (1 Sam. 8:6-7). And the history of Israel is a history of kings being killed and replaced. But not even David, who was rightly and divinely chosen to replace evil Saul, would take by force what was rightfully his (1 Sam. 24:6-7). Instead, he waited for God to act, and God acted by making David king in due time. So God does in fact set up kings and states, though ideally only God should be the head of any country. But that time is not yet, and for now we are under human governments. If we were to be given the opportunity to start over completely, what should Christians do? Should we set up any government at all? The problem with anarchy is that the more aggressive and less ethical are going to wreak havoc on society, such that everyone would have to keep constant guard over themselves and their property, and everyone would be a vigilante (but see this video for a defense of anarchy). But if there must be some form of government, then it is our obligation to pray for that government to leave people in peace and bring evildoers to justice. Every human government will become corrupt in time; the cycle never ends until God intervenes. Our loyalty as Christians must always be to God and righteousness above all, not blindly given to the wicked just because they are the state. Worship God, not government. 1 War as self-defense is just, but war all over the world under the excuse of protecting our homeland or ideals, or of coming to the alleged aid of other countries, is not just. And most alleged requests for US soldiers to spill their blood for non-US citizens are of the false flag variety anyway.